A simple ‘no’ can tell you a lot about this latest Q3 S Edition, as well as Audi’s move into the budget end of the luxury SUV segment. Here’s the ‘no’ count, then. No, this Q3 S Edition does not come with those cool daytime LED headlights and tail lights. No, there is no quattro in here. No, you don’t get the seven-speed S tronic automatic transmission found in other Audis. And if you think this Q3 S is squarely aimed at the soon-to-be-launched Mercedes GLA-Class and the BMW X1, well, the answer is ‘no’ again. Not only will the Q3 S Edition take on traditional rivals like the GLA-Class and the X1, it will also entice buyers who’re considering the Honda CR-V, SsangYong Rexton and Toyota Fortuner. 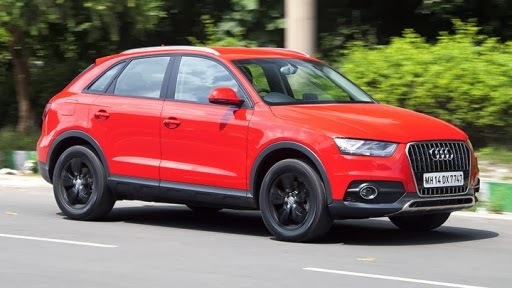 Looking at the Q3 S, you might mistake it for a top-end or limited-edition crossover. The S is every bit as desirable as any other Audi out there. Sure, the LED lights are gone, but the headlamps still look aggressive in a Mustang Cobra kind of way. The S comes with a decent serving of chrome tastefully applied to the vertical slats of the grille. Adding sporty character is the cherry red paint, brushed aluminium roof rails and black alloy wheels. Even at standstill, the S looks racy enough to take to the track – still, Audi should have invested in an ‘S Edition’ badge somewhere on the boot lid or front fenders. Stepping inside the Q3 S is one of those rare occasions of joy: this car comes in simple black leather trim – no wood, no beige anywhere in here. This may not find favour with the typical Indian buyer, who equates luxury with beige and wood, but we love it; it adds to the sporty theme. The dashboard and center console get faux brushed aluminium plastic panels. Cost permitting, it would’ve been nice to throw in some red stitching on the seats, Audi. There’s Bluetooth connectivity, infotainment system and audio rear parking sensors (no parking camera in this trim) – but no navigation system. Of course, the biggest change inside is the manual gear lever and clutch pedal. Turn the key, and you’re greeted by the hum of a diesel motor. No corners cut on sound deadening, and passengers are isolated quite well from the diesel clatter. With an ‘S’ in the name, it should’ve had a petrol engine, but worry not, this 2.0-litre diesel mill is no slouch. It makes 138bhp and 320Nm, sent to the front wheels via a six-speed manual transmission. During our drive, the ’box felt smooth and the shifts precise, but the clutch was heavy. With the heavy quattro system taken out, the Q3 S has lost over 100kg and now weighs in at 1,520kg. Minus that extra weight, the power feels more than adequate; the S lunges forward at the tap of the throttle. It also doesn’t complain going over bad roads, maintaining composure even above 100kph. While it rides well, it also impresses in the handling department, feeling light on its feet, the short wheelbase making it agile around corners. There is a bit of understeer, as you’d expect from a FWD, but the grippy 17-inch Pirelli Scorpion tyres hold the tarmac well. And in the event that you approach the wrong side of physics, the Electronic Stability Control will keep things under control. The lack of four-wheel drive does make the Q3 S engaging to drive, but we wish the steering had some more feedback. In a mix of conditions ranging from city crawls to highway runs, the S managed 13.4kpl, which should make owners very happy. Audi claims 17.3kpl, which doesn’t sound entirely impossible to achieve. For the Indian consumer, the S ticks all the right boxes. It’s a sporty package with an oil burner under the hood. It’s got the regular tech toys – barring a navigation system – and of course, the fun factor of a manual ’box. At Rs 25 lakh (ex-showroom, Delhi), the Q3 S is Rs 5 lakh cheaper than the cheapest Q3 in the market. So if you’re looking for a luxury German SUV that won’t burn a hole in your pocket, look no further.